Grinnell Glacier hike in Glacier National Park, Montana, is the most beautiful hike I have been on to date. We took the trail from Many Glacier Inn about a mile along Swiftcurrent Lake to Grinnell Glacier Trailhead to start the hike. We then started up the trail through gorgeous greenery and the smell of fresh pine. We passed Lake Josephine, a large body of water, and saw some people on the trail that had seen Grizzlies. We were on a road trip doing things on a whim, so we weren't very prepared for this. Note to reader's, bring bear spray on this hike and make sure you are being loud on the trail. Grizzlies don't like to be snuck up on, it's usually when they get scared that they attack. For the remainder of the hike we were nervous to say the least, but continued onward aware of our surroundings, staying on trail, and making noise. 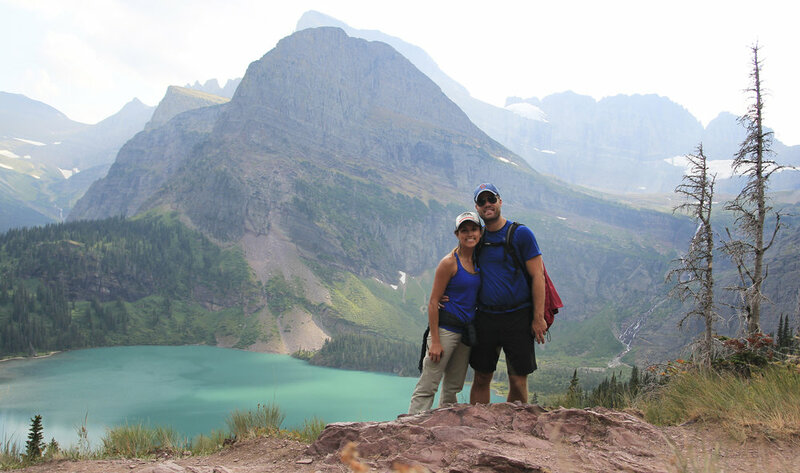 Eventually we reached an amazing view of Grinnell Lake, a gorgeous body of water of glacier melt. Rock flour consists of fine-grained, silt-sized particles of rock, made by the grinding of bedrock by glacial erosion. It becomes suspended in meltwater making the water appear cloudy. When the sediments enter a river or lake, they turn the color grey, light brown, iridescent blue-green, or milky white. Grinnell Lake is a gorgeous iridescent blue-green. This view in the above photo was absolutely stunning. Where the image fades we could also see many waterfalls coming down the mountain in addition to this pristine lake.